Major League Baseball had its midsummer classic last this month, but no one can top Metcam’s all-star lineup of equipment in its advanced automated fabrication center. From robotic press brakes to panel benders and fiber lasers, the lean manufacturer’s new tools deliver eye-popping production stats. How about reducing metal fabrication job setup time from 30 or 45 min. to 90 sec. or less? That’d be Metcam’s Amada Auto Tool Change Press Brake. The Prima Panel Bender can do in six hours what used to involve three press brake setups, three operators and two shifts. And what if you could schedule the cutting of 5,000 lbs. of material overnight? That’s already a reality at the Georgia Manufacturer of the Year’s Alpharetta, Ga., plant with its new 6,000-watt fiber laser. Of course, all the efficient production means added savings for Metcam’s metal fabrication, finishing, assembly and logistics customers. The Amada Robotic Press Brake has two robots attached, one a material handler that provides blank material to its forming counterpart and on the back end takes the formed parts and piles them on a skid. 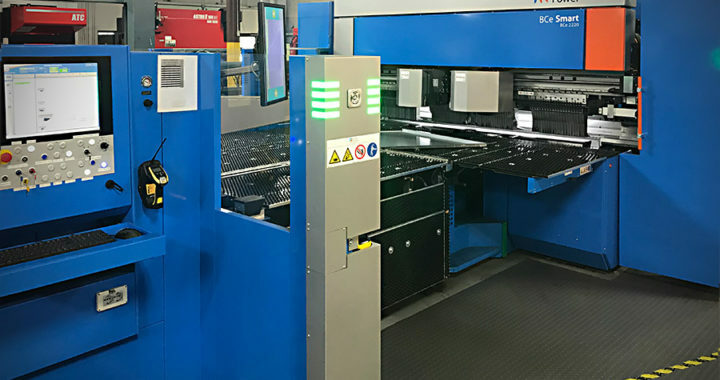 You can put a stack of flat, punched or laser-cut blank material in front of the highly automated machine, walk away and come back when the cycle is complete. Difficult-to-form fabrication parts that have a lot of bends and need great accuracy are perfect for the robotic press brake. Unique to the Amada Auto Tool Change Press Brake is its attached library of tools, which can reduce setup time by a factor of 30 or more. Imagine having a fabrication job that requires 12 bends. You might have to set the press brake up three or four different times to do groups of bends, which would be very time-consuming with a regular press brake. 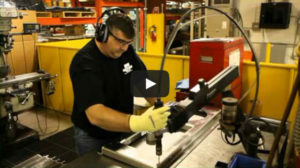 Setups on an auto tool change press brake can really help bring costs down for customers. The Prima Panel Bender requires only one operator to handle large sheets of material that normally would take two people. The forming is done entirely by the machine, which the operator simply loads and unloads. It can also do its own setup automatically at high speeds just like the Auto Tool Change Press Brake. In short, the Panel Bender reduces cycle time, improves accuracy and decreases the chance of workers being injured through repetitive handling of large sheets of metal. Finally, Metcam’s new 6,000-watt fiber laser, made by HK , can match the output of the company’s other two lasers, but with higher speed and greater efficiency, coupled with lower maintenance and operational costs. The fully automated cutting machine can tackle 5,000 lbs. of metal after Metcam employees have clocked out for the day. It can run “lights out”! Metcam has positioned the advanced automated fabrication center equipment for added efficiency. For example, large panels of metal sheets, such as those used in commercial HVAC systems, come off the laser at a high rate of speed and only need to move about 30 feet to the panel bender to be formed before going straight to welding, hardware or the paint line. Whether material processing or movement, lean manufacturing always means designing and delivering reduced costs and business complexity for Metcam clients.